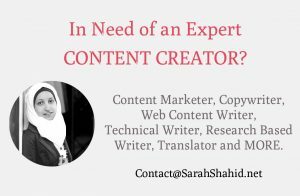 Content Creator, Translator, Editor, Designer, Blogger, Researcher and Social Activist. An ambitious and hardworking person. Interested in Books, Arts and Cultures. ▪ I’m preparing my Master’s thesis which is titled “Behavioral Analysis of factors affecting Supply for the purpose of increasing Labor Market Efficiency”. ▪ Organize a medical book fair. ▪ Develope plans to achieve the sales target. The most common Arab photography website and printed photography magazine. AL Manar Book Centre (MBC) Provides a comprehensive and an innovative approach to regularly update and keep academics fully aware of all our publishers publications at reference, academic, professional, general, and textbook level. ▪ I organized a medical book fair in Aleppo University. ▪ Two lectures: Self-development tools & English Language Self-Study in cooperation with Syria Trust for Development. ▪ I’ve participated in many lectures, sessions, webinars, workshops and forums to share my experience in Freelancing. ▪ I’ve worked on developing content plans and strategies based on my experience in content marketing. ▪ I’ve worked on many articles, researches, brand stories and building brand identity content. ▪ I’ve participated in translating a book called “Start Up Nation”. Msh Lwahdk is a first-of-its-kind initiative in the Arab world. The purpose of the initiative is to provide psychological and medical services to those who may need it, in addition to engage them within the society. Matar project is a non-profit initiative that aims to serve the blind in the Arab world by recording them aloud or printing them on the Word program. Fn is a youth movement believes that the solution is always inside the art. TED is a global non-profit dedicated to ideas worth spreading. This initiative aims to build an independent family based on trust and understanding, a family that is active in society and capable of solving its own problems. Afkarz is a platform that allows young people to express and share their ideas. EIEA is charitable development association working on education and awareness among the people. Mobadroon provides training and consulting services to civil society organizations in Syria.